The Dobermann WC 100 is a fantastic boot for the budding high school racer. The flex rating of 100 is perfect for the lighter weight skier to be able to bend and flex to provide them with control over their skis. Nordica's Race Pro Fit Liner is very stiff and designed to reduce packing out too quickly. EDT Technology bolts the bootboard right to the chassis of the boot for a high torsional strength, and quicker turns edge to edge. The World Cup 95mm last is as narrow as any boot available on the race circuit. ServoLock Buckles give you more leverage and power to give you a firm and secure wrap across your shin and foot. 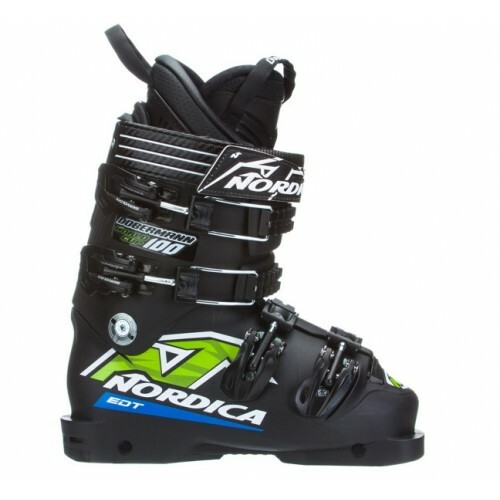 If you are a strong racer who needs a boot with power, the Nordica Dobermann WC 100 is the way to go!